Okay, so have you ever come across one of those "Top 10 Gay Songs" lists somewhere, and you go in all "OH SNAP I like gay things!" and get all excited, and then you actually READ it? YMCA. The Killing Of Georgie. It's Raining Men. Booooring. Wouldn't it be nice if there were homo-centric songs that you actually wanted to listen to? 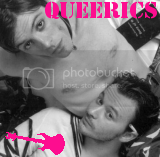 And so Queerics was born, in order to archive indie/alternative/electro/generally fabulous songs with lyrics that are a little bit so. Posting access is locked--you can get site-related updates here for your convenience and discuss whatever you want in the comments, but if you want to start new topics, you should join the Queerics LastFM group.